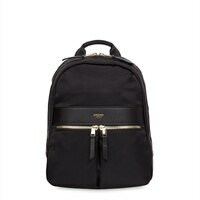 The compact version of their best-selling Beauchamp backpack. Small and beautifully formed, this is the perfect way to carry your tablet and daily essentials in style. Knomo Mayfair Collection Mini Beauchamp - Backpack for Tablet - Fabric - Black, GoldThe compact version of their best-selling Beauchamp backpack. Small and beautifully formed, this is the perfect way to carry your tablet and daily essentials in style.